Black Forest Cake is a favourite birthday dessert in our family so to have it made gluten-free is an amazing treat, it's not as complicated to make as it looks, as the recipe is pretty forgiving. Prepare your pans your two 9" cake pans, by buttering the pan, then lining the bottom with your parchment round, then butter the parchment round. Add your cocoa powder to the first pan and shake it around, tilting it in every direction until the interior surface is lightly and completely covered. Turn over the pan and firmly knock out any excess cocoa into the second pan and repeat. Turn over the pan and firmly knock out any excess cocoa powder into a bowl. Wet your tea towels thoroughly and ring them out, pin them around the pan as pictured. 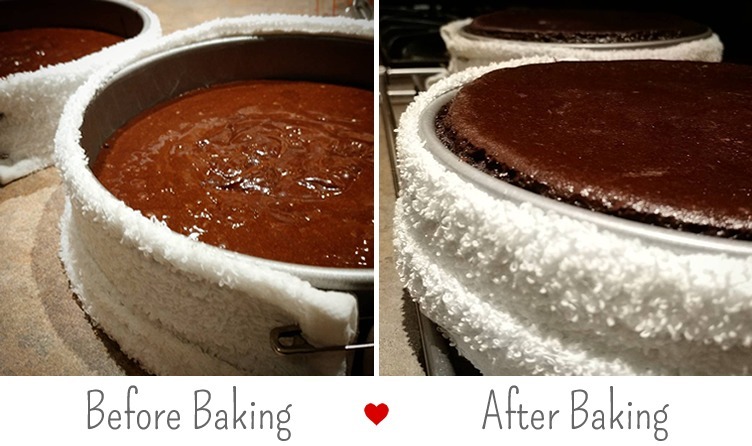 This will make your cake rise evenly and flat instead of with a domed top. After you've removed the cakes from their pans, you're going to have them both bottom up, pour some of the cherry jar juice, a spoon at a time onto the cakes, it will absorb into the cakes and make them more moist and add a cherry flavour, approx 4-6 large spoons per cake. Place the first cake bottom up on your serving plate and cover with 1/4 of the whipped topping. Add second cake layer top up, and cover the top and sides with 1/2 of the whipped topping, it doesn't have to be perfect as you're covering it with chocolate shavings anyways. Using a piping bag and 1M tip, pipe circles on the top outside of your cake to act as a bed for your Maraschino cherries to sit on, you can go around the bottom of the cake with the excess topping. 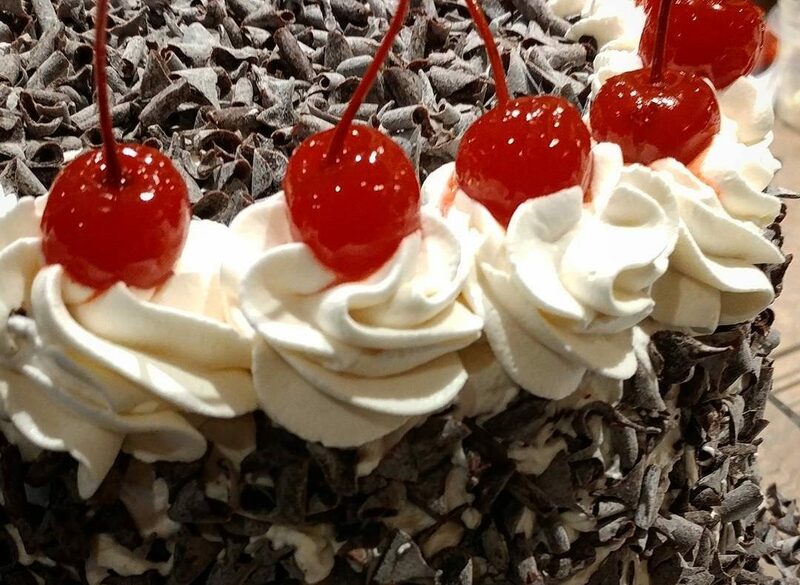 Add Maraschino Cherries to the top of your cake at the centre of each of your circles. Refrigerate until ready to eat. Serve by cutting slices between the circles so that each slice has a decorative maraschino cherry top.